I received the final pickup for which I was waiting, the Seymour Duncan Trembucker, so I began basic assembly today. The first thing I did was to install the Trembucker in the pickguard and wire it up. You may notice there is no Chrome/nickle cover for the Trembucker – I had to order one from Seymour Duncan. Apparently nobody stocks such things locally. But I didn’t want to wait for it especially since I will also be blocked from final assembly by waiting for a Tele jack cup. This means I will need to take apart the pickguard one more time. That is also why I left many of the pickguard screw holes empty. The next thing to do was to do the coarse level “relief” set in the neck. It turns out the flattest thing in my entire apartment is my kitchen counter so that became my level surface for measuring the neck. The idea is to try to set the neck as straight as possible using the coarse truss rod adjustment in the back. Then you install the neck, string to pitch, and set fine relief. If you don’t know what I am talking about, go back and have a look at the post called Day Zero. So here is the guitar with the neck installed. It was pretty easy. Next thing is to string to pitch and then do a basic setup. But first I want to show you one of my many mistakes. I chipped the damn finish! See below. Now fine relief setting. You put a capo on the first fret, depress the last fret on the neck, and measure the distance between the string and the 8th fret. 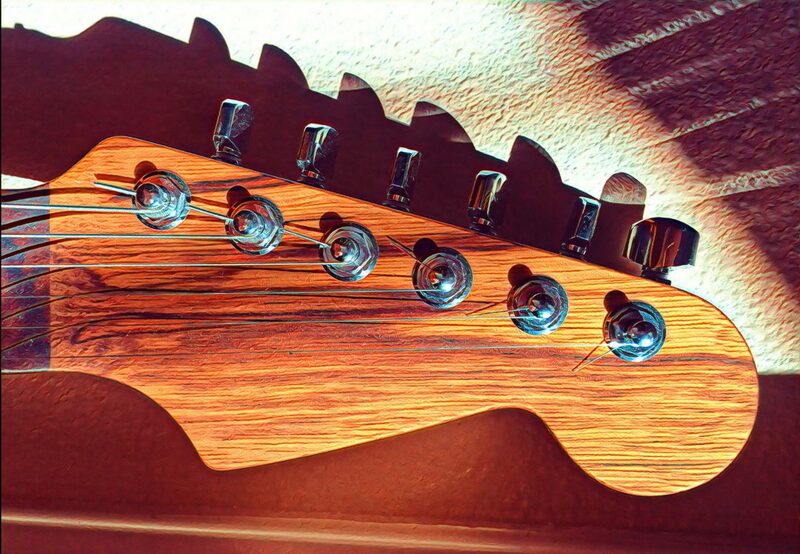 The guitar string, once fretted at two positions, acts like a perfect straightedge. The relief should be about 0.01″. Then, time to set the string height. On Fender guitars with individually adjustable string heights, this is pretty easy. You set the string height at the 17th fret for the low and high E strings. I set mine to 3/64 of an inch. Then using a string action height tool, you adjust the other 4 strings to match the radius of the fretboard at the 17th fret. In my case, the Frankencaster has a 10-16″ compound radius fretboard so I used a 16″ tool to set the string height. By the way, you may have noticed the copper color between the bridge and the pickguard in the photo above? This is how I eventually decided to ground the bridge. The bridge is connected to my homemade Faraday Cage inside the guitar cavity through a strip of copper tape, on which it sits. Having fussed around with the string height, the guitar is now out of tune again because the strings have all been stretched as their heights were raised. So the next thing is to re-tune and then set intonation. To set intonation, I tuned the guitar then fretted the guitar at the 12th fret and played all of the six strings in turn. The idea is to lengthen or shorten the strings by adjusting the bridge pieces to get each string playing exactly the same note at the 12th fret as it does when played open. I need to say one thing about the company (Warmoth) from which I ordered the neck and the routed body. The craftsmanship and the level of finish and quality on these two pieces was exceptionally high. The fit and finish was perfect and the alignment of everything could not be better. Next: Next post: Power on! Or not so much. Maybe there is a super fancy guitar-approved way to patch that chip in the finish, but if it were me, I’d pick up some blue nail polish at Walgreen’s.